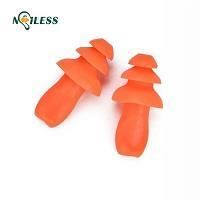 Use more types, recognized as more comfortable and good sound insulation foam earplugs. soft and comfortable PU foam earplugs with the best sound insulation. This earplugs high flexibility, can be easily shaped into the shape of the ear canal, but compared to the bullet and rocket type, due to the two widths, one end into the ear canal is not easy to rub into the appropriate size of the ear canal.